Location: Holden is just north and west of Worcester, MA. I drove past the UCC church on the main drag in town to get to St. Francis. Accessibility for Newcomers: I really appreciated that the pastor announced the page we were on in the bulletin and where we were in the prayer book. It’s a great gift of the Anglican tradition, but the movement between the worship bulletin and the prayer book can be a tricky balancing act for newcomers. Hospitality: St. Francis has three services: Saturday 5pm, Sunday 8am and 10am. Rich and his wife Hathy invited me to stay overnight with them in the church parsonage, which was both incredibly generous and made it possible for me to preach all three services. Also, St. Francis has a church cookbook and they gave me a copy. I love church cookbooks. Worship: I was surprised how much I enjoyed the 8am service without singing. At every service, We prayed by name for about 10 people related to the congregation serving in the military and for the president. I was grateful for both. 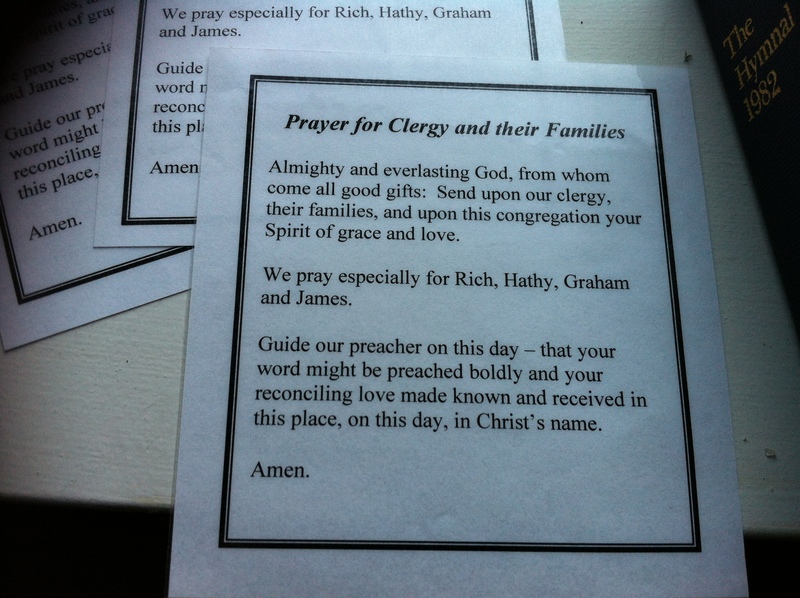 Ecumenical Stuff: Rich came from the United Methodist tradition, so there were some built-in sensitivities to others Christians who might be worshipping there. He also mentioned that the clergy in town did get together, and they worked particularly with the local Lutheran church. Rich pointed out that the Saturday 5pm service does seem to have more people who have been formed by the Roman Catholic Church and were able to imagine worshipping on a Saturday. I was a little surprised to be distributing communion and have a congregant approach expecting me to place the communion wafer directly in his mouth. That was new for me. I knew of that tradition, but had not been in a place to actually distribute communion that way before. The 8am service was a decidedly Anglican crew. At 10 am, when I asked who had been formed by other religious communities, almost everyone raised their hand. Coffee Hour: Sadly, I never made it back there. I did spot the Equal Exchange Fair Trade Coffee, though. And I saw home-made baked goods-always a welcoming sign. The fellowship hall was decorated with endearing felt banners made by the Sunday school. The deacons led this prayer before worship began. a wonderful community! lovely saturday evening service! hello Rich and Karen!